« Spotlight Sunday: Homes Still Available for July 4th Weekend! 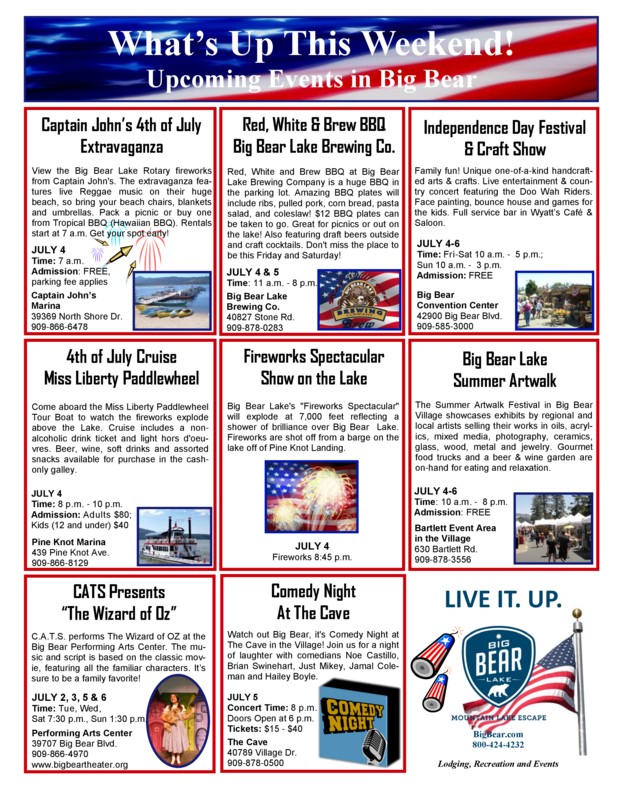 We are ready to celebrate Independence Day here in beautiful Big Bear Lake! Our weather looks to be warm, with highs in the 80’s, some afternoon cloud build up and potential scattered thunderstorms through the weekend. Don’t worry though, our summer storms are usually quick to clear out leaving lots of sunshine behind. And, if you have never smelled a rainstorm in the mountains, you are in for a treat! There are a wide variety of activities and events happening all around town throughout the weekend and be sure to find a good spot to watch our amazing Fireworks Spectacular on Friday night. Have a blast!! RS Vacations reminds you that absolutely NO PERSONAL FIREWORKS are allowed in the Big Bear Valley. It was a very dry winter and our fire danger is high, so please be fire safe in all you do. We do not have any cabins left for this weekend, but if you are planning a future stay, be sure to visit us at our website and check out all of our beautiful cabins. We have something for everyone and unmatched customer service. Book your Big Bear Cabin today!